When we took our monster road trip to the east coast last year, I was planning on driving a Chevy Tahoe. 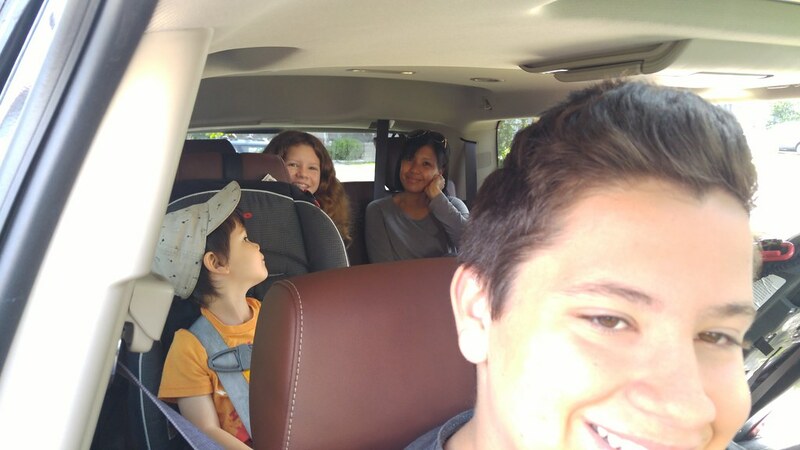 The Tahoe is very large, and with the six of us driving 5837.4 KM, I wanted the space. Instead, we took that trip in a Chevy Traverse, but I had a mental note to try out the Tahoe next summer. That's exactly what I did last week. With the week off work, I planned a camping trip for me and my oldest and family trips to the aquarium, CNE and bowling alley. 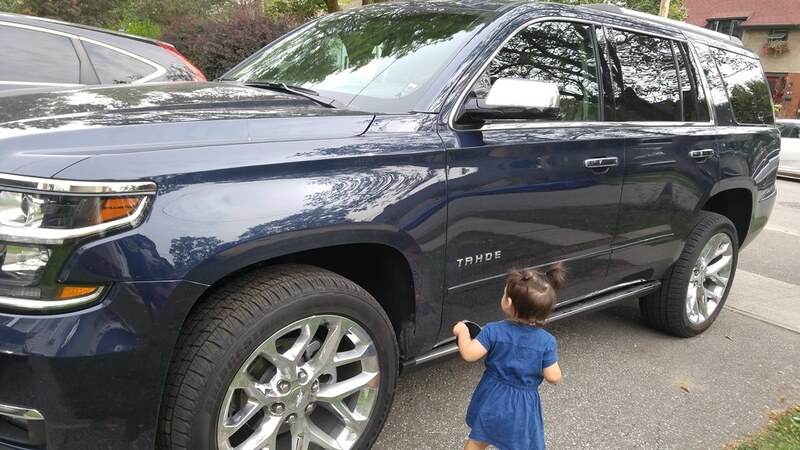 As advertised, the Tahoe is full-sized. Three rows of seats and 94.7 cu. ft. of cargo space. When I parked my '99 Mazda Protege and hopped in the 2017 Chevy Tahoe, I not only had to adapt to the size difference, but the upgraded power. It's great fun zipping along in a 5.3L V8 and rather addictive. My kids also appreciated the 4G LTE Wi-Fi while I enjoyed the satellite radio. Another feature I quickly took for granted and seriously missed when I returned to my Mazda was the in-windshield display. As you looked through the front windshield, you could see your current speed. It wasn't distracting or annoying but rather clever and convenient. Now that I have to take my eyes off the road to check my speed, I realize how much safer this was in the Tahoe. The Tahoe is nice. I'm a Ford guy though so myself I would go with either the Flex or Explorer. @ Jason, I also a Ford guy, and the Expedition would probably be the direct comparable to the Tahoe. Just horrendous on gas, as I rented one once to ferry my family and visiting relatives, and I think it got 15 or 16 litres per hundred kms mileage wise. @Rick C: How long ago was that? Cause my buddy's parents had an Expedition in the early 2000's and it was a gas pig. I've got a buddy that has a new F150 with Ecoboost and he says it's decent on gas. It's not as good as they say it is mind you but still pretty decent. I keep seeing Chevy comercials that advertise this. How's it work? Does the car have it's own hot spot or something? I'm guessing it goes through your phone right? Doesn't that eat up your data? It actually has nothing to do with your phone. t's a built-in 4G LTE wifi hotspot that can connect up to ten devices. According to my two oldest who used it, the connection worked very well. re: 4G LTE Wi-Fi hotspot, I had wondered if it's a "bring your SIM card" type of thing where you pop it in? This article is two years old and US-specific but it mentions, there, an individual is locked into AT&T with that OnStar service and the 4G LTE, at least at the time of writing, and it's not "bring your own SIM". I assume the Canadian models probably have an agreement with somebody like Bell or Rogers who provide that data connection? I sure didn't give my SIM card... and the Wi-Fi worked even when no device was connected via Bluetooth. @Jason, about 3 years ago, and it was a V8 version. 15 litres /100 Kms is a lot for me, since my daily driver is a Prius V, getting close to 5-5.2 Lts/100Kms with it. which SUV are you leaving towards for the family? The Hyundai Santa Fe is really nice. @Mike: Yeah I guess a minivan would be practical for you. Have you looked at the Chrysler Town and Country? My buddy's wife bought one last year and loves it. Supposed to be good on gas for a minivan. Good for them, their kids and all their stuff. Was this post sponsored by Chevrolet? Are you asking if GM paid me for this post. They didn't give me one red penny.